Here’s my cooking plan for this weekend – all to be done ahead or quick to assemble and cook with a little help from the guests! 1 Blanch the trimmed asparagus in boiling water for 3 minutes then drain and run under cold water to cool. Pat dry. Dry fry the pine nuts in a small heavy based frying pan for 2 minutes until golden. 2 Preheat the grill to medium high. Mix half the pesto with the olive oil in a shallow dish then add the asparagus and toss together to coat. Arrange the coated asparagus in the grill pan. Grill for 4 – 5 minutes turning until tender and lightly charred on all sides. 3 While the asparagus is cooking cook the linguine in a large pan of boiling water for 3 – 4 minutes until just tender. Drain thoroughly and toss with the remaining pesto. 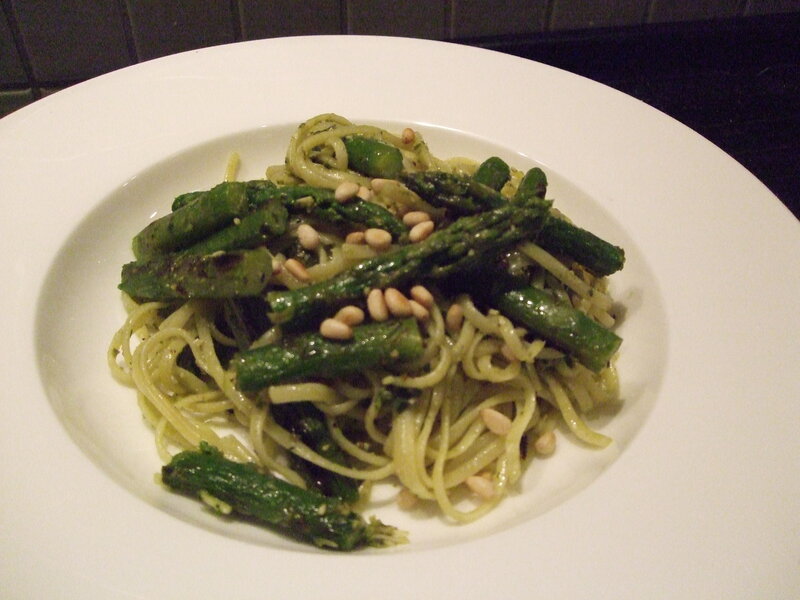 Cut the asparagus into 4cm lengths then toss with the pasta, pine nuts, grated lemon rind and juice. 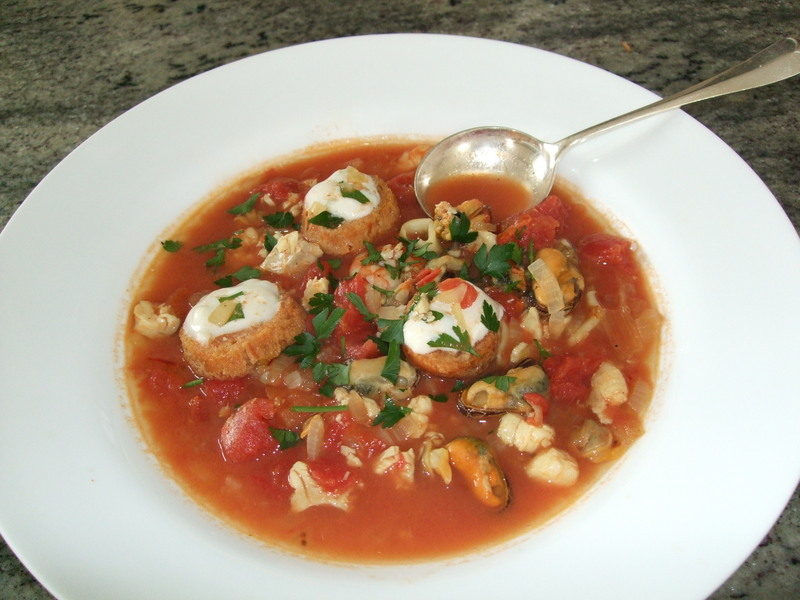 Serve with grated Parmegiano. The young will need bribing to cut the grass for me so I’ll be serving them Saffron scones with the last of my homemade bramble jelly and cream, and slabs of my Busy Mum’s Healthyish Banana cake…..
1 Heat the oil in a medium pan and cook the onion for 5 minutes until softened. Add the garlic, bay leaves and saffron and cook for a minute. Stir in the chopped tomatoes and fish stock. 2 Bring to the boil and add the cubed cod. Simmer gently for 3 minutes then add the seafood, bring to the boil and simmer for a couple of minutes until heated through. Check seasoning and discard the bayleaves. Serve in warm basins with toasted baguette, grated Gruyere cheese and a spoonful of rouille. Short cut: Rouille is a mayonnaise flavoured with roasted red pepper and garlic. It’s a lot to make just for two so I do cheat and stir a little red pepper pesto into some mayonnaise instead or buy ready made! Spread on slices of toasted baguette, scatter with grated Gruyere cheese and place in the warm serving bowl before adding the stew. For pudding I’ll serve really good local ice cream with the chocolate brownie recipe from Busy Mum’s Cookbook – it’s the best ever…. I serve this lamb with creamy Pommes Dauphinoise or the first of the new season’s tiny potatoes if I can find them..
1.Preheat the oven to 200C Gas mark 6. 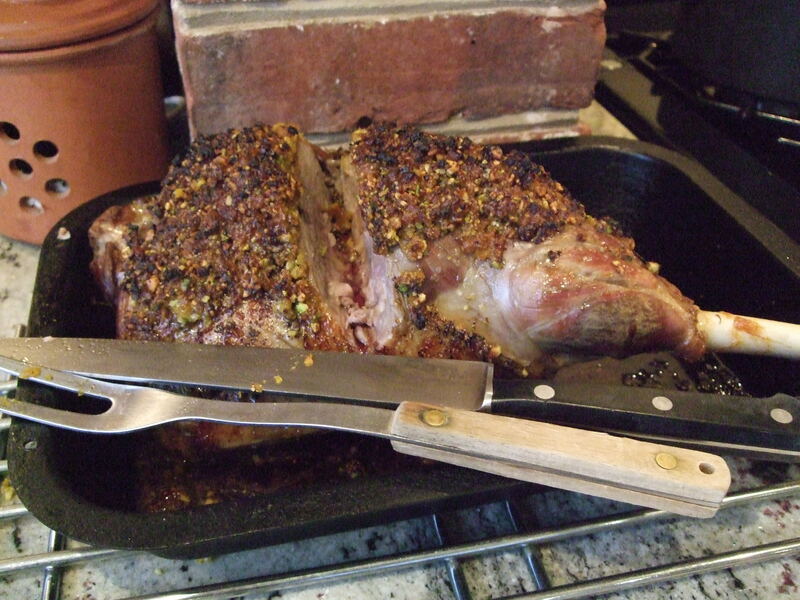 Place the lamb in a roasting tin and pierce all over with a small sharp knife. Insert slivers of garlic into the piercings. Rub the skin with olive oil and season. Roast in the oven for 30 minutes then reduce the temperature to 180C Gas mark 4 for a further hour. 2.While the lamb is cooking, process the apricots and pistachios together in a blender or processor until finely chopped. Stir in the cheese, lemon rind and juice and seasoning. Remove the lamb from the oven and press the apricot mixture over the surface of the lamb. Baste with the pan juices and return to the oven for 15 minutes until the surface is browned. 3.Remove the lamb from the oven and transfer to a warm platter. Cover loosely and leave to rest for 15 minutes. Add a couple of tablespoons of flour to the pan juices and cook for a minute, stirring, then whisk in red wine and stock and bring to simmering point to thicken. Add more liquid as needed then season. Serve with the sliced lamb and steamed broccoli. To decide how long to cook your lamb, give it the initial 30 minutes at the high temperature then drop the oven down and cook for 20 minutes per 500g/1lb for well done and 15 minutes per 500g/1lb for medium rare. Follow up with my really easy all-in-one Blackberry and Apple cake from the Busy Mum’s cookbook, made this month with rhubarb and 1/2 teaspoon ground ginger and served warm with clotted cream or good local vanilla ice cream. My favourite is from Simply Ice Cream – a local Kent producer. This entry was posted in In season, Recipes and tagged Asparagus, Bank holiday cooking, recipes, spring lamb, Sunday lunch. Bookmark the permalink.